I also asked the friend I referred and he confirmed that he also got $25 for free! Do you have a payoneer account? Click Here to open one for FREE and earn $25 within some days. It is real I am a living testimony. In my previous post, I wrote about How to register for your Payoneer MasterCard or Debit Card for Free using your Voters Card. Read my previous post if you have not created an account on payoneer. In this tutorial, I will explicitly explain to you earn money online through payoneer affiliate in Nigeria. Before I continue, I would like to give you a summary of what Payoneer is all about. Payoneer is a Company founded in 2005 and based in New York. They issue you a U.S bank account, routing number and a prepaid MasterCard you can easily use to transact business online for free. They help you to send and receive money globally and you can also use your Payoneer MasterCard for online transaction and to withdraw cash at ATMs worldwide. Click Here to create a payoneer account if you haven’t. You stand a chance to earn your first $25 by signing up through the link. Click here to learn how to sign up. 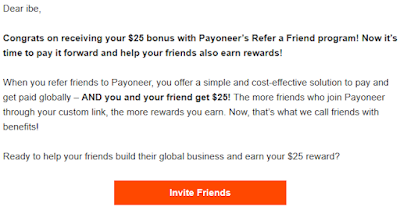 Do you know that you can earn up to $25 through Payoneer affiliate program for just referring a friend colleagues to Payoneer? 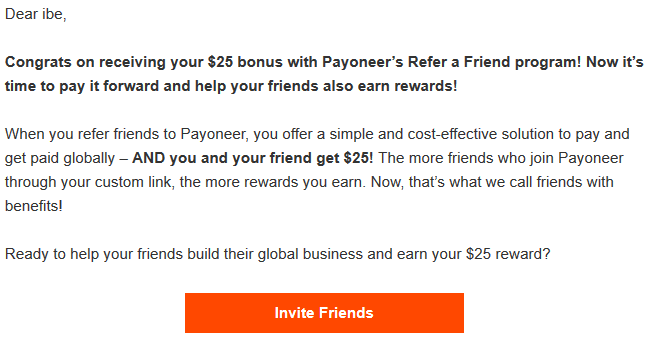 Yes, as easy as it sounds, you earn as much as $25 dollars when someone opens a payoneer account through your referral link. Also, they too earn $25 for signing up for payoneer account through you. You just tell your friends about payoneer and also the benefits of the “Payoneer Refer a Friend Program”. If they are interested, send your referral links to them by email or share it on social Media like Facebook and twitter. Once they sign up through your referral link, you are sure of earning $25 one day. Once they make up to $100 in their Payoneer account, you get $25 credited to your account (that's about N4, 667.5 using the official zenith bank Payoneer dollars exchange rate of N186.7). Also your referral will be credited with $25. So no one loses. Click the Refer A Friend Button. A page with your unique referral appears. Now click the “Copy” button as shown below. 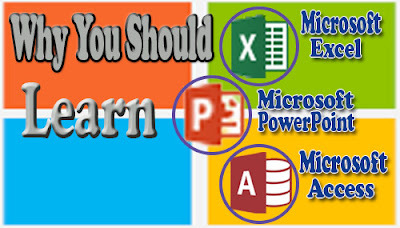 Now you can the link in your blog post or emails. You can also share your referral code on social media such as Facebook, Twitter and LinkedIn. There are buttons there where you can just click to share your unique referral link on your social media profile. It really works. I have made up to $4200 with this strategy. After you have received your payoneer MasterCard has been activated, it can be used to make withdrawal on any ATM with MasterCard. You can also use it to pay and receive funds online. You can fund Payoneer card by telling another user to transfer funds to the card. You can as well load it with funds using other cards. Besides that, you can link it with your PayPal account or link it to Payoneer partner sites that pay affiliates directly into US bank. There are many ways to make money online into your payoneer account. If you own a website or a blog, you can make money online by promoting various products on sites like Clickbank, Amazon and other popular affiliate programs. 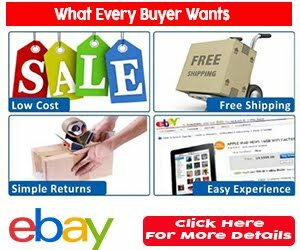 These sites pay in dollars and some of them pay up to $5 per sale they make through your site. When these money accumulates and when withdrawn and converted to naira, they turn to big amount of money in Nigeria. Also, if you don’t own a website or a blog, you also have many opportunities to make money online. You can decide to join commission junction or do some menial job on Fiverr. If you can write articles or web design or good in graphics design or photography, then join Fiverr to make money online legitimately. If you are an Author or want to write a book, you can write and e-book, publish them on some online popular book stores like Amazon and CreateSpace. With the huge web traffic and marketing strategies adopted by amazon, you would make reasonable sales. Then withdraw your money using Payoneer. I wrote a step by step tutorial article on how to setup and self-publish on Amazon and CreateSpace. Check it up! I also wrote a review of Amazon, CreateSpace vs. other online publishing platforms and why I have chosen to publish on Amazon and CreateSpace. The other time I visited Ogbonge blog, he also shared his own testimony. Read his testimony Here. If this tutorial helped you, it can also help your friends. Share this post with your friends on Facebook, Twitter and other social media by clicking any share button below. Have any further inquiry about payoneer affiliate program? Comment it below in the comment section. I will help you out!